Thomas Engert moved one stop closer to defending his International Challenge of Champions title this afternoon when he eliminated Gabe Owen 5-4 and 5-3. The only player left standing between Engert and another $50,000 check is Fong-Pang Chao from Taiwan. Engert eliminated Efren Reyes on Wednesday with a thrilling table run in sudden death and then moved on to his match with Owen today. Owen eliminated Japanese star Yoshihiro Kitatani on Wednesday. 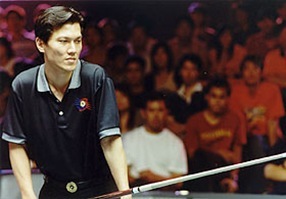 Chao looked like he would be watching the finals from the bleachers today, but a miss on the 6-ball in the sudden death game by Niels Feijen allowed Chao back to the table and he took full advantage. If Engert wins, it will be his second straight Challenge of Champions win. Chao is looking for his third win. The Challenge of Champions is sponsored by Olhausen Billiards and Viking Cues.